South Africa Balks At $29 Million Presidents Cup Price? In his Golf World I Think, I Saw, I Heard notes, Tim Rosaforte says the PGA Tour blew a chance to return the Presidents Cup to South Africa in 2019 where Ernie Els would be perfectly aligned to captain. You'll be shocked...shocked..to learn that it was all about the money for the Finchem administration. Rosaforte says the PGA Tour asking price was $29 million to hold the cup, South Africa balked, and Australia will be ponying up $25 million to host the Cup as well as next year's World Cup. 2019 Presidents Cup Headed To The Sandbelt! AP's Doug Ferguson leads with the oddity of a veteran like Phil Mickelson encountering a situation he'd never seen (a match adjustment penalty), and one started by his switching to a harder ball in hopes of reaching a par-5 in two. But with this score adjustment for a rules violation element, reader RM makes a fair point: there is no such thing as dormie if you're two down with one to go! Woohoo! "I was talking with Jay and I just thought, 'Gosh, I'm going to ask. I'm sure it's not an issue,'" Mickelson said. "And it turns out that there was a one-ball rule and it was an issue. As a player, you need to know that. You need to know the rules, and if you have a question, you do it beforehand." No one knew the ramifications. The penalty for violating the one-ball rule is called a one-hole adjustment, meaning the one hole is awarded to the other team. But the rules committee erred when it told Mickelson that he was out of the hole, and Mickelson picked up his ball. Because the one-hole adjustment already had been assessed, Mickelson should have been able to finish the hole. He was in the fairway just over 290 yards from the hole, which he could have reached with a good shot. But he never got that chance. Day made birdie and won the hole, so the International team went 2 up heading to the eighth hole. Steve DiMeglio explains the committee's effort to remedy its error. 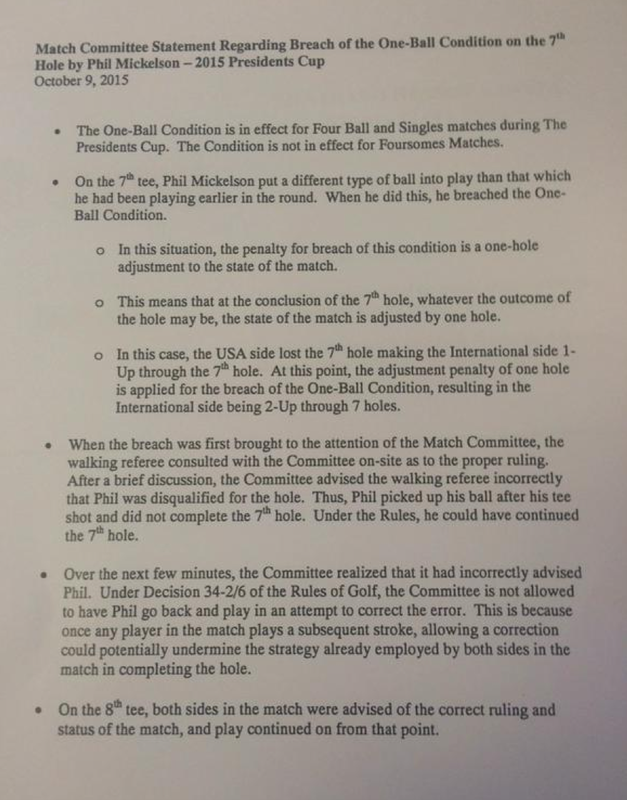 Although the Match Committee realized that it incorrectly advised Mickelson, under Decision 34-2/6 of the Rules of Golf, the committee is not allowed to have Mickelson go back and play in an attempt to correct the error. According to a statement released by the committee, "Once any player in the match plays a subsequent stroke allowing a correction could potentially undermine the strategy already employed by both sides in the match in completing the hole." Sean Martin covers the other key match moments for Mickelson-Johnson v. Day-Scott, which was halved. The post round interview with Phil and Zach, along with Todd Lewis's thoughts on Golf Central. All of this added up to some much needed controversy, as Rex Hoggard notes, but it did not create any new tension between the teams. **If you're still confused--and many of us are--Mike Johnson at GolfDigest.com has a nice FAQ summary. Day One '15 Presidents Cup Pairings Are Out & Will Remain Out! Not quite the kick-off we were hoping for is it for Wednesday night's 10 pm PT start, is it? Especially when the first match out may be the most intriguing? And they're playing a video game course. In the middle of the night. And all of the players get along. Oh well! G.C. Digital with the day one foursomes matchups that left Bill Haas, Chris Kirk, Charl Schwartzel and Sangmoon Bae (!?) on the bench. Because, why would anyone in Korea want to see him play on day one? Maybe the camera noise will generate a little necessary controversy? Steve Elling explains. **Steve DiMeglio in Korea on how the Jordan Spieth-Dustin Johnson foursomes pairing came about. Rex Hoggard concurs, the potentially exciting matchups didn't happen. Add Alex Miceli to the list of uninspired by the pairings, too. Golfweek: Phil For The Prez Cup? Really? Let's face it: the Presidents Cup is just not a compelling competition. Initially an attempt by Tim Finchem to milk some more profits in the wake of the Ryder Cup, the matches have had some nice moments (Royal Montreal and Melbourne), but lacks much sizzle when the venues are lacking (like, now and in the foreseeable future). Short of bringing back stymies or going to magnificent courses, there is no real reason to get interested in the biennial competition as it heads to Korea this year. Yet the captains did their best to make it compelling Tuesday with edgy selections, notably Nick Price picking soon-to-be-exiled-to-military-serviceman and rising star Sangmoon Bae, who gets to play in his native South Korea (assuming some crazy General doesn't intervene!). On the U.S. side, Jay Haas and son Bill said all the right things in explaining the very justifiable captain's pick by father of son. But the pick of the day that generated the most social media vitriol: Phil Mickelson by Haas as America's second option over names like Holmes, Snedeker, Horschel. Golfweek's Jeff Babineau is perplexed by the Mickelson captain's pick. Forgetting about the Gleneagles mutiny he helped to lead in one of the more bizarre post-event pressers of all time, Phil has been a model ambassador on Tour, the kind of guy who shows up to some city, smiles a bunch and signs as many autographs as any three other players combined. Hey, wives are a big part of the team events, don’t forget, and in Amy Mickelson, Team USA gets a modern-day Barbara Nicklaus. Friendly, genuine, highly popular. The real deal. But what does the U.S. get in adding Phil the player, the one who stands before us today at 45? Well … that’s the painful part, the part in which the needle screeches across the vinyl, and where everything grinds to an awkward halt. Sadly, performance-wise, elevating Mickelson onto the Presidents Cup team makes no real sense. Since walking off the green with his fifth major – and first Claret Jug – in the summer of 2013, Mickelson has pretty much been an invisible man as a competitor. As much as he has tried to fire up the engine the last two years, losing weight, getting fit, pounding balls … the motor just hasn’t turned over. He hasn’t won in 26 months. That’s quite a spell. In 39 starts over two seasons, he has contended two times, albeit in majors. **Bob Harig couldn't make the case for Phil on his play, and wonders if this was a celebratory selection or something else. Or maybe it's something more, a bit behind the scenes, inside the team room, so to speak. Could Mickelson's pick to be part of the U.S. Presidents Cup team be a form of validation, a nod to what Lefty did last September at Gleneagles, when he shockingly spoke his mind and questioned the captaincy of Tom Watson, as well as the direction the PGA of America was going as it related to the Ryder Cup? Mickelson took plenty of grief in the aftermath of that entire episode, but you didn't hear much, if anything, from those who were there as the Americans suffered another defeat at the hands of Europe, a third straight, and sixth out of the past seven. Poll: Should Haas Pick Haas For The Presidents Cup Team? There have been a few suggestions of nepotism should Bill Haas, after a closing 72 at the Deutsche Bank will be just outside the 10 automatic spots for the Presidents Cup, be one of dad Jay's two Captain's picks. Randall Mell presented all of the scenarios before Monday's final round. The situation is certainly an intriguing one. Knowing how much the family loves sports, it was no surprise Bill was almost distraught after his round Monday. But unless there is pressure to add a veteran star, it's hard to see how Jay does not pick Bill. Or does it look bad? Who would be your two Presidents Cup picks?